The Panavia Tornado is a family of twin-engine combat aircraft, which was jointly developed by the United Kingdom, West Germany and Italy. There are three primary versions of the Tornado; the Tornado IDS (Interdictor/Strike) fighter-bomber, the suppression of enemy air defences Tornado ECR (Electronic Combat/ Reconnaissance) and the Tornado ADV (Air Defence Variant) interceptor. In 2008 Air Forces Monthlylabelled the aircraft "for more than a quarter of a century... the most important military aircraft in Western Europe." With the aircraft in the twilight of its operational career, we finally have a decent rendition of the Panavia Tornado in 1/48 scale. 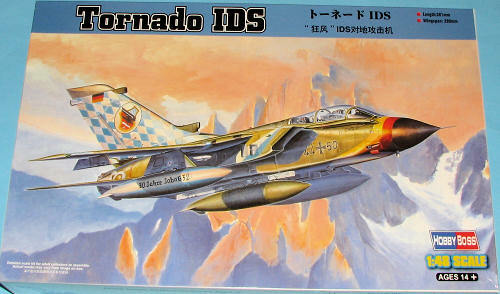 Previously, both ESCI (reboxed by Italeri) and Airfix have tried to provide us with this aircraft in 1/48 but both were honestly not the kit that many of us had hoped for. 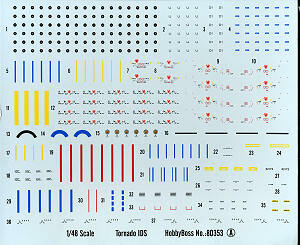 It looks like third time is the charm in this regard as the Hobby Boss kit looks to be superbly done. The kit features recessed rivets and panel lines, well detailed tandem cockpits with acceptable bang seats and a canopy that can be posed open or closed. There is also a radar package face and antenna with a separate radome so that can be posed open if you wish to do the additional work to do so as the kit does not show it as being able to be built in that position (which begs the question of why provide a radar). The kit also has deployed flaps, slats and upper wing spoilers. There seems to be no full swept option available, however that has not stopped Hobby Boss from providing wings that are geared so you can sweep them. You also have the thrust reversers and speed brakes in the full deployed position as well. On the ramp, you almost never see these in anything but the static position. I often wonder why all this stuff does not have the static option, but that is Hobby Boss for you. I'm sure that with a bit of trimming, a competent modeler can make the necessary changes. The wings already have the holes drilled for the pylons. These are designed to swivel though not in conjunction with each other. With no swept wing option, why bother with this feature? The instructions show you attaching the pylons and all the weapons prior to gluing the wing halves together so this moving feature is kept intact. I suggest foregoing the moving pylons and cementing them in place after the kit is painted. The kit is obviously designed for an upcoming ADV version a s the fuselage is in three parts; a forward nose, main body, and exhaust section. This will make parts alignment critical. 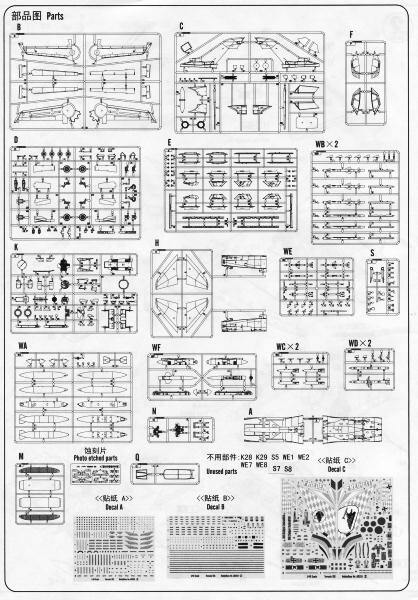 Instructions show the fully completed sections being mated together in the final step. A cautious modeler will want to look things over to see what can be left off until after all the major fuselage bits are joined. Other features are an optional position refueling probe, separate rudder, plus extensive stores (drop tanks (3 types - total of 5), (4) Mk 82 with BSU-49 bombs, BOZ-100 chaff/flare pod, ECM pod, MW-1 munitions dispenser and (2) AGM-88, (2) AIM-9 and (6) ALARM missiles). Also includes photo-etch parts. These p.e. bits are mostly for the slat and thrust reverser attachment points. Instructions are two larg e fold-out sheets with instructions on both sides. Gunze paint references are given in the very well illustrated construction steps while a number of paint company options are given in the full color decal and external painting guide. 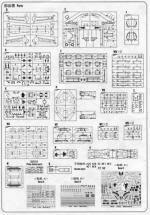 There are markings for two aircraft: A Luftwaffe JBG 32 special scheme plane as shown on the box art, and an RAF GR.1 from TWU1/45 Squadron. There are aftermarket decals available for this aircraft if one looks. There are three very large decals sheets. The biggest has the unique markings and measures 8x8 inches. Another is for data and a third is for weapons/pylon markings. 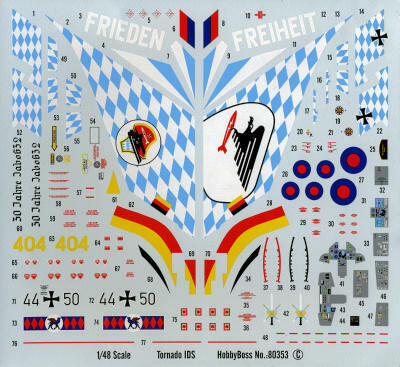 These are about the same size as the main sheet so you get lots of decals with this one. They are superbly printed and should work just fine. So there you have it. Another very nice new mold kit from Hobby Boss. 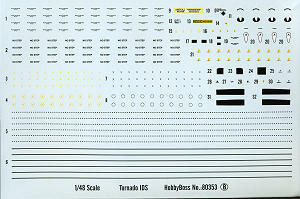 It is sure to please those wanting a nicely done Tornado and should spur a few aftermarket sheets as well. My thanks to Squadron Products for providing the preview kit.